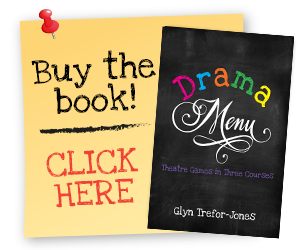 Drama Menu Theatre games from Drama Menu by Glyn Trefor-Jones - A collection of theatre games, drama games, improvisation ideas, drama lesson plans and ideas for drama. This group of theatre games made for a great session with my drama kids and was all about layering and building energy. I chose a load of fun, energy starters – I used chairs instead of newspaper for the Crocodile River Rafting but my drama kids are quite mature so I can see why the author suggested the use of a newspaper for some groups. I used the groups from the Crocodile River Rafting to go into 3 Events and Energy Steps; the 3 Events exercise was a lot of crazy fun and the kids really enjoyed the scenarios that it threw up, most of them were totally crazy but a lot of fun to rehearse and perform. After a discussion about the work, we decided to layer the work a little more and build to a climax as opposed to having climactical events throughout the piece – this is where Energy Steps came in extremely useful; great theatre exercise and it really honed in on that skill of building a piece to a climax so that they could see a definite shape to their work; it was aiming somewhere, driving towards a dramatic, concluding finale. We used these skills in the final exercise What Happens Next and I was very particular about the suggestions that I accepted, only taking those that would further the narrative and drive to a climax.